Seldom seen, often heard... and the results of their "shooting" known far and wide... the Alpheids can be easily identified (if you can find them) by their very short eye stalks and one much larger "pistol" claw. This specialized appendage is capable of punching holes in all crustacean exoskeletons, even many shellfish! Alpheus and Synalpheus species are the notable symbionts with Shrimp Gobies. Pistol Shrimp are the predominant crustaceans on the world's reefs... and so you are likely to run into them... they eat most all types of foods... and if kept fed will often leave other crustaceans and mollusks alone. See happily fed specimen above in title bar. Snapping Shrimps, family Alpheidae. Noted for their noise making capacity, myths re the power of their large claw (a .22 caliber, tank-cracking...) and commensal to mutualistic relationships with fishes (mainly Gobies) and invertebrates. An unidentified all-red pistol shrimp at Interzoo 2010. Synalpheus demani Deman's Pistol Shrimp. Live in Crinoids. Indo-W. Pacific. Synalpheus stimpsonii (Man 1888). White body with varying dark markings. 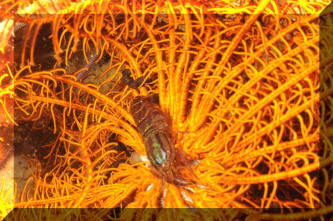 A crinoid (Comanthina, Oxycomanthus) commensal that often displays contrasting color to its host. East Indo-West Pacific; Singapore, Thailand, Indonesia, Japan, Australia. N. Sulawesi pix. Seen this in the wild? An apparent tunnel through a stony coral, in this case a Montipora? There is/are Alpheid/s living in the formed (by them) tunnel complex. Unidentified Alpheid in a crinoid. N. Sulawesi pic. Yes, it really is THIS red! I had an idea about the identification of one of the pistol shrimps marked as unidentified. The caption reads "Unidentified Alpheid in a crinoid. N. Sulawesi pic. Yes, it really is THIS red!". I believe I have the answer (but of course could be wrong). 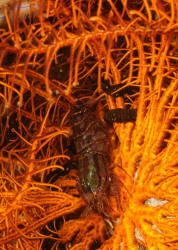 I think it is actually a Feather Star Squat Lobster, Allogalathea elegans, (or very close relative). It seems to be nestled in a Feather starfish. These particular lobsters reach about 1 1/4 in and form a symbiotic relationship with this particular starfish even changing their colors to blend with it. They hide within their arms. I remembered seeing a pic almost exactly like this and went back to my books. *Encyclopedia of Aquarium and Pondfish* by David Alderton, ISBN 978-0-1566-3678-4, published 2008, lobster, pg291, starfish pg297. Don't know if I'm right, but, your site is all about gathering knowledge and this is just too cool a species (if that's what it is), for hobbyists not to know about. This is the link with the "unidentified" shrimp. http://www.wetwebmedia.com/pistolshrimps.htm Hope you guys are enjoying yourselves. 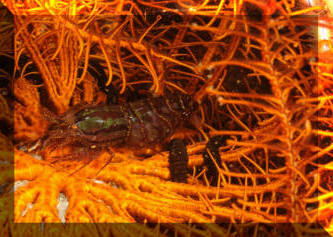 Just saw the gorgeous shrimp from IZOO, listed as “to-be-identified”, on today’s dailies. It appears to be Alpheus soror, aka the “Bullseye Pistol Shrimp”. I’ve seen them available on the ‘net listed as such, but found a listing in Debelius’ Crustacean Guide of The World (2001), page 147. It lists length up to 3.5cm, distribution as “Maldives, Sri Lanka, Philippines, probably widespread to IWP”. It also goes on to state that the two photos listed “show an undescribed species, possibly of the Alpheus diadema-group. It has purple walking legs, and a conspicuous large ocellus on the second abdominal segment.”. Hope that helps!